This hasn’t been our best week at Chez Champion of My Heart. Lengthy nosebleeds. Sudden allergic reaction. BUT, we also got some good news after Lilly’s recheck date with our veterinary internal medicine and veterinary radiology team. After 3 weeks on a SCARY antibiotic (chloramphenicol) for a MRSA infection and another 2 weeks on a normal antibiotic (baytril), the creepy lesion inside Lilly’s lower lip is MUCH improved. A follow-up ultrasound also revealed that the HUGE blood clot in Lilly’s right rear leg has improved significantly. It’s still there, but it no longer fully blocks the artery. The blood clot news gave us some leeway to drop the blood thinner (plavix). That decision comes with certain risks, but after several nosebleeds — lasting many hours at a time — we giving a change in meds a try in hopes of stemming the tide. We just cannot have Lilly bleeding for hours on end, several times a week. Lilly’s face was a bit puffy during our veterinary internal medicine consult Wednesday. It was clear from her behavior and how she held her head that she was feeling poorly. Still, I never expected her head / face to balloon the way it did once we got home. Lilly’s nose started dripping blood around 10 am Tuesday, on our drive to the veterinary hospital. It didn’t stop until sometime around 1 am Wednesday morning. Not kidding. At its worst, Lilly was simultaneously dripping blood from her nose and choking on what was going down her throat. Scary times. As the plavix, which we were giving once a day in the evening, got out of her system, the nosebleed finally stopped, but we still faced unprecedented facial swelling. Thanks to nearly instant access by phone and email to our team of veterinary specialists, we got the order to give Lilly Benadryl 3 times a day. I’m happy to report it worked. Lilly still doesn’t look normal, but the swelling has greatly improved. Heading into another chemo weekend, Lilly is remarkably steady on the neurological front. Almost comically so. We made a few other meds changes this week to see if we can better balance the various side-effects. So far, it seems to be working. Lily certainly had a rough week. But I”m glad she seems to be doing better. Hoping the upward trend continues. Sounds like a very rough week. Hoping that this weekend is going better. Wow. What a week. It sounds like things are on an uptick, thank goodness. When Coop had his face-swelling-shut-choking-as-his-throat-closed allergic reaction a few weeks ago (to fire ants…) I was in a total panic. I can’t imagine how scary it must’ve been for you on top of everything else. Wishing you the best. What challenging times. Poor Lilly! Hope things continue to improve. 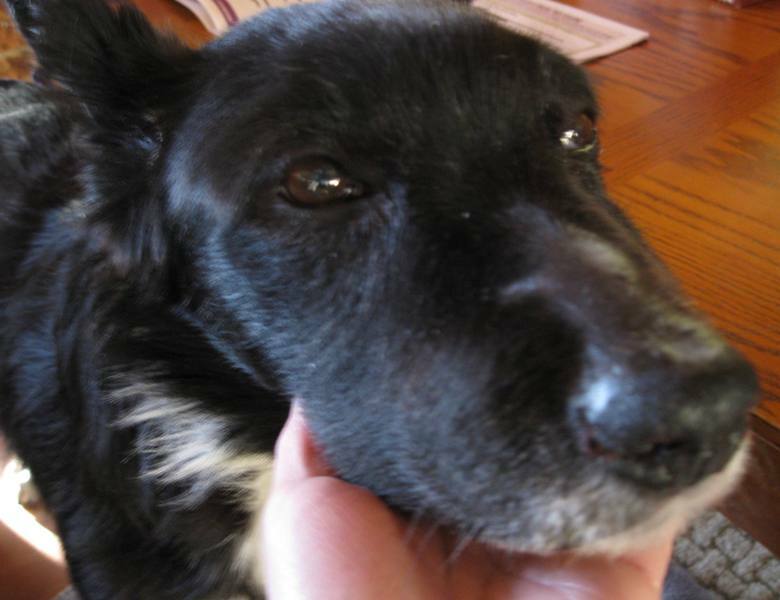 I remember how helpless I felt when Shadow’s tumor started bleeding enough to obstruct her breathing. It was terrible. And yet she was such a happy girl most of the time. It’s a tough balancing act to give Lilly the best quality of life. I’m glad you’ve gotten some good news and hope you can manage things well for her.